Who is the richest person in the world, ever? Does where you were born affect how much money you’ll earn over a lifetime? How would we know? Why—beyond the idle curiosity—do these questions even matter? 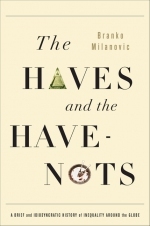 In The Haves and the Have-Nots, Branko Milanovic, an expert on wealth, poverty, and the gap that separates them, writes about how wealth is—and always has been—unevenly spread throughout our world. Milanovic uses history, literature and stories from today’s newspapers to discuss the major division between the haves and the have-nots. This thought-provoking book discusses among many other ideas just how rich Elizabeth Bennet’s suitor Mr. Darcy really was; how much Anna Karenina gained by falling in love; how wealthy ancient Romans compare to today’s super-rich; where in Kenyan income distribution was Obama’s grandfather, and how location where one is born determines his wealth. The book explains why inequality matters, how it damages our economics prospects, and how it could threaten the foundations of the social order that we take for granted.